Professor Gokay Deveci's Integra House has been shortlisted for a design award. 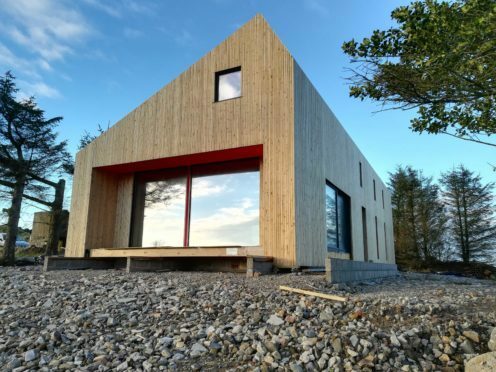 A north-east architecture professor’s eco-friendly house, made entirely from timber, has been shortlisted for a major international design award. Professor Gokay Deveci created the plans for his home, Integra House, after noticing a shortage in the number of affordable properties in rural parts of the region. By extending the roof truss to the entire building – including the walls and floor – the “super structure” can be built cheaply then packed full of wood wool insulation to meet low energy standards. The first Integra House is under construction in Tyrie, near Fraserburgh. Its design has been recognised by the upcoming Timber Trade Journal awards in the Innovative Productive Design category. Prof Deveci, who teaches architecture at Robert Gordon University, said: “At present there is an acute shortage of affordable homes in rural communities – just one in ten homes are considered affordable, in comparison with one in five in urban areas.